I made a video on AO and Banished. Make sure your textures are not applied to your mesh, and that you are using just a basic light grey material. The default material in 3d studio max is fine. Because im using Nvidia Mental Ray renderer, I choose "Ambient Occlusion (MR)" in the video for the "Output". You will choose "Diffuse" or "Lighting Map" if you dont have an AO selection in your software. It works just the same as long as you put a white (255) light in your scene. Thanks you alot Shock !!! i usually always texture every pieces before i move them to their designed spot so when my mesh is ok, everything is already textured out ... Do I need to save and paint everything with a grey neutral color ... do my rendering, and then cancel back the recolorations to my original textures ? The skylight can go anywhere it doesn't matter where it is placed, it is not a direction of light beam, but a full area light from every direction. Thanks for that, but unfortunately it seems that there is not a single option that is consistent between blender and 3dsmax! The UV channels for example. 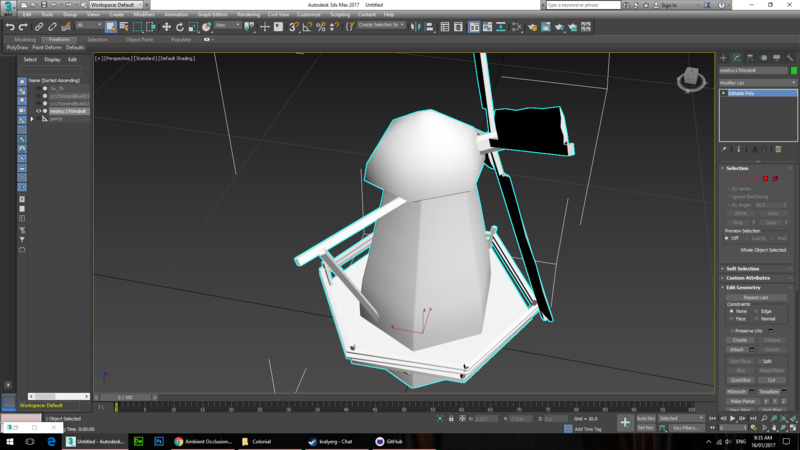 In Blender you can add as many UV views as you wish, however they are called 'UV' then 'UV.001" "UV.002" etc. You can rename them, so when Banished looks for channel 2, does that mean it is looking for a UV map that is specifically called UV Channel 1 and UV Channel 2, or is it just the second one in the list? I also read that the AO in Blender is not dependent on lighting in the scene, perhaps this isn't true. The video did give me some ideas of things to play around with, so I'll see if I can get something that works. Hi @ShockPuppet would you mind sharing some screen shots of some buildings with AO applied as a texture? @Necora sure when I'm off my phone I'll do a with and without comparison. I'm using AO for a variety of visual tricks, other than light/dark it's snow manipulation. Any particular area of AO interest you? Well, I'm trying to figure out what I a doing wrong with mine. I am using just a white png at the moment, but would like to get a proper AO going on the buildings. The white png works, but it lacks definition, and when I added it to the new crops I made, they are really dark in the light and glowing in the dark. With buildings when I add a proper baked AO, it keeps coming out too dark, no matter what I do. I've tried removing all materials and textures, adding a plane beneath the model, adding sunlight above the model, it seems to make hardly any difference to the AO. Plus, having to load it up in game each time to see the difference is a pain. That is why if I could see a screen shot of a model, a simple house or barn will do, in 3ds max with AO applied as a texture, I can see what is meant to be dark and what is meant to be light, how dark is dark and how light is light, and can play around with my settings to get something similar. So for now a basic light:dark AO would be good. You know that the modkit can see changes you make on the fly? If you load up your mod in the modkit, then Alt-Tab out, and then change something about your building, then Alt-Tab back into the game, it should have changed the building instantly. It's really handy for checking things like sprites/tooltips/drop down menu items. But it should work for model changes and textures, too. I've never tried it with crops, but you should give it a go. I did not, but thanks that makes life way easier. It works with AO, doesn't work with changing materials, you have to re-build for that. I'd still like to see those screen shots though Shock if you don't mind. Without AO - in 'solid' mode (texture mode without a texture is just pure white). Note that materials are applied here, but the 'Diffuse' has been turned to pure white and intense. If you bake AO with the 'normalized' button ticked, it forces it to ignore the materials, so you don't have to remove materials to bake AO (so the internet tells me...). And with AO - in 'texture mode' so you can see how it fits. The solid gray in blender is still darker than in yours, not sure if that makes much of a difference but I have made it as 'white' as I know how. Removing materials will actually make the solid building darker. I have not inverted this AO map, and it was unwrapped using the 'Smart UV Project' unwrap option. My bake settings were - Margin 10px, Samples 10, distance 10m. I have not tried changing any of these settings to see what difference it makes. I think the UV unwrap was actually the most important change I made between this AO and the terrible ones of earlier attempts. Using the 'Smart UV Project' option keeps the correct proportion of all faces, where as I did try the 'Unwrap' and 'Lightmap Pack' options before. 'Unwrap' seems to result in a lot of overlapping faces in the UV map, while 'Lightmap' makes everything a nice even square. It fits it all in, but when the whole oblong face is reduced to a tiny square, any detail is lost and what should be a small shadow either doesn't show up, or ends up covering half the face in dark shadow. I did not change the finer details in the 'Smart UV Project' UI, because I have no idea what they mean! How much of an effect does the AO have on the lighting of the building in game? I've noticed with a pure white AO, certain crops are far too dark during the sun periods and far too light during the rain periods. Will a good AO even this out? a huge difference, and yeah a proper AO will help crops during the various summer and winter and rain conditions. Necroing on an old subject but how does the AO map manipulate snow? I know some modders are just using a white pic as placeholder and don't bother with AO at all. In my current project i just baked the AO map and overlayed it onto the texture map in GIMP, thus having only one file (plus the white AO Placeholder at 16x16) and saving space while still having the look of AO. What's the downside to this approach? @jesta I actually don't know how to do this, when Shock mentioned it just went straight over my head and I could not even think about how it can effect shadows and snow at the same time independently. However, I did just try to make a road texture. When I made it, it would become so snow covered in the winter, that you could not see it. The mod kit did throw up a warning when it was built, saying that the texture I used had an all white alpha channel. So I changed this to a transparent alpha channel, and the roads now show up in the winter. That leads me to think that maybe the snow covering is due to the alpha channel of the AO not the baked AO itself? I think this might be something worth playing around with. Perhaps, open the AO in gimp. Then copy the AO into another layer, so you have two identical layers. Then, in the bottom later invert the picture, so the black areas (edges... shadows) become white. Set the new black areas (the old white areas) to transparent, and save it. Then it might give you some cool snow effects, if it works the same as a road. I have not tried it, and I could (probably am) be completely and utterly wrong, but after making the road perhaps this is how it works. It will be cool if it does! As for the white AO, I used to use it too when I could not get AO to work. However, it does interact with the lighting of the game. Without the AO, I find that in 'rain' the buildings are very bright and in 'sun' they are quite washed out. The AO tempers this, as it interacts with the environment lighting in the game as it changes between seasons. So in 'sun', the AO results in stronger shadows on your model, while in 'rain' it diminishes a bit. It adds more definition to the model, that you will not get with a pure white AO or with an overlaid AO. This bit ... this wins the day I have a few road mods with roads that I use every map, but they all 'white out' in Winter. Maybe a future update of road mods may read this info and update the roads with this tip. @QueryEverything yup the problem is that usually when the mod kit throws up a warning, it is an error and it cannot continue to build the mod. This one isn't an error, it is a little line that pops up telling you the texture transparency is all white, but continues to build. So if you are not looking, it goes so quick, you'll miss it. I only saw it because the only thing I was trying to build was one road texture, so only had a few lines in the mod kit build so saw it right away, then just assumed that was what was causing the winter white out.